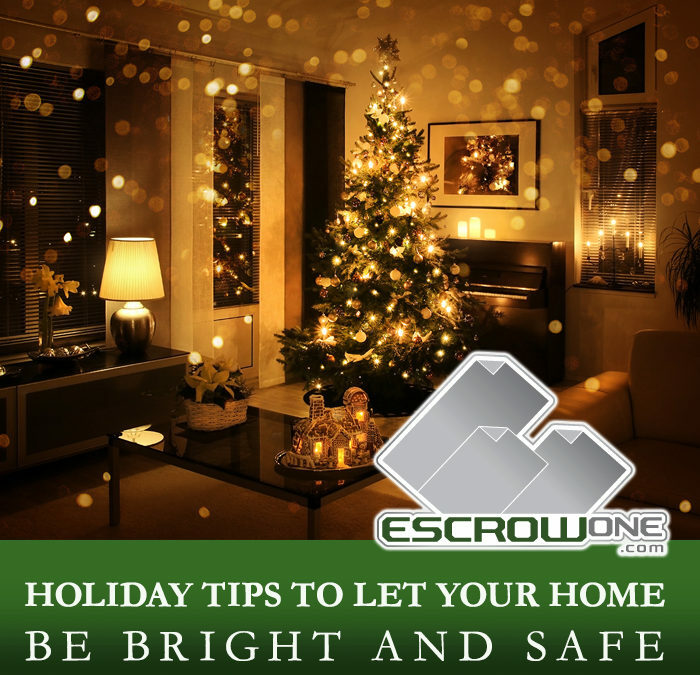 Holiday Tips From EscrowOne, Inc.
Let Your Home be Bright and Safe! The holiday season is the most wonderful time of year to celebrate, give to others and decorate our offices and homes with the most beautiful displays of trees, ornaments and lights. We at EscrowOne, Inc. would like to offer some helpful tips and reminders this holiday season and always, to keep our offices and homes safe from tragedy. Take a moment to read below to ensure your holiday is one of family, feast, and wonderful memories created to last a lifetime. 1) Be sure that all lights are used properly. Do not over load outlets, circuits, etc. Follow guides as to how many lights can be plugged in together and if they are meant for indoor or outdoor use. Avoid using old or damaged lights that may increase fire danger. If you are in question, please seek advice from a licensed electrician in your area. 2) Be aware and increase your security! Holidays are a high target for theft. Keep your home locked, lights on and create a neighborhood watch program within your community. Avoid letting everyone know when you will be gone or traveling for the holidays on social media. You may be inviting the Grinch! 3) Keep live trees watered and as fresh as possible. Use flameless candles as an alternative and keep all burning candles away from fresh pine branches that will dry out over time. Always properly dispose of real trees as soon as the holiday festivities are over to avoid fire danger. Contact your waste management in your area for details. 4) Last, our favorite, all the baked goods and feasts that are prepared. Be sure to set a timer and always present when the oven is on! This will avoid burnt items, over-spills and possible fire hazard.